Crandon Park has long been a favorite recreational spot for natives and visitors alike. Crandon is located just south of the Miami Seaquarium and north of Bill Baggs Cape Florida State Park. This beautiful beachfront park on Key Biscayne in Miami Dade County is comprised of various ecosystems of the Key including mangroves, seagrass beds, coastal hammock and dunes. Come to enjoy the natural Florida flora and fauna including herons, coontie plants, sea turtles, hawks, ospreys, butterflies, songbirds, prickly ash and beach peanuts. Seagrass beds provide a home for mangrove snapper, parrotfish, crabs, shrimp, sea stars and puffer fish. Bear Cut Preserve, inside Crandon Park, offers naturalist-led tours through the hammock, beach and ocean wildlife communities via a tram ride. The Biscayne Nature Center is a beautiful facility on the north end of Crandon Park on Key Biscayne. In this pristine setting, the multifunctional Center serves visitors with a reception area, exhibit space, gift shop, an audio visual presentation room and demonstration lab classroom facilities. 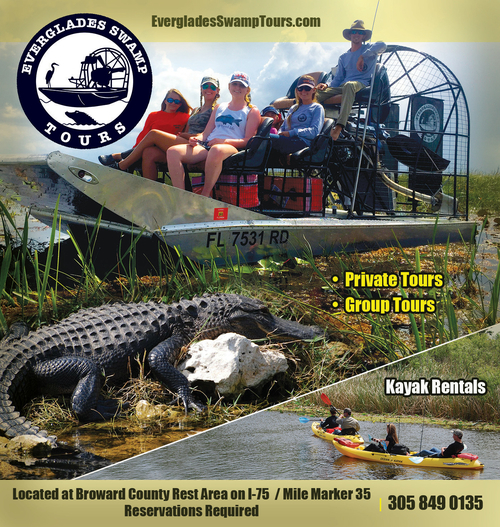 The Marjory Stoneman Douglas Biscayne Nature Center, Inc. is a not-for-profit Florida corporation whose interest is in the conservation of our local irreplaceable natural resources. Kite-Boards, cabanas and Kayaks may be rented and adventure tours can be booked through Eco-adventures. Golf and tennis areas, tables and grills, and convenient parking for over 3,000 vehicles make Crandon a destination for sports and picnics. The guarded beach is popular most for the relatively calm water thanks to an offshore sandbar. The sandbar changes constantly because of seasonal squalls, storms and currents. The beach is what's called a lagoon style, or low surf impact beach, and the shoreline varies--sloping from wading depth to six to twelve feet, depending on the tide. The best beach access for wheelchair users is at the north end of parking lot 3, where there are accessible parking spaces, shelters, showers, concession stand and chickee hut in sand with connecting sidewalk. The onsite Marina has space to park your boat and boat ramp access. The Club Nautico Miami rents 20-100ft motor boats for 4 to 8 hours and is located at the Crandon Park Marina. To reserve a boat call 305-361-9217. The Crandon Park Amusement Center is also within Crandon Park and was once the home to the old Zoo (now a garden), carousel and skating rink. The carousel, restored to it's former glory, is one of few sea-side carousels. In addition to the carousel, the amusement center also features an old-fashioned outdoor roller rink, dolphin-shaped splash fountain, and a beachfront playground. The amusement area is open weekends from 10:30 a.m. - 5 p.m. A birthday picnic shelter is also available for rentals. The carousel operates weekends and holidays only. Three rides for $2.